As part of CPD’s annual Leadership Council, over 100 grassroots leaders representing 30 CPD affiliates from all over the country headed to Capitol Hill on May 9 to meet with their Senators and Representatives. Collectively, we held more than 30 meetings with members of Congress from 26 states to elevate our core priorities -- including Medicare for All, adequate funding for the opioid crisis, more robust support from FEMA for hurricane victims, and a legislative solution to the crisis that Trump created when he ended Deferred Action for Childhood Arrivals (DACA) and Temporary Protected Status (TPS). CPD affiliates connected these national issues to the particular needs within their own cities and states, making real the need for federal action. In 2017, CPD affiliates joined together to help block some of the most devastating aspects of this administration’s agenda. In 2018 and beyond, we are ready to go on the offense and demand the freedom to thrive for all communities. With our day of action and lobby visits on May 9, we kicked off our “Summer of Heroes.” Every week throughout the summer, CPD affiliates will be in Washington DC to participate in mobilizations, lobby visits, and other federal fightback and advocacy efforts. During May and June, this will include supporting the Poor People’s Campaign, which is leading an effort to unite people across the country to challenge the evils of systemic racism, poverty, the war economy, and ecological devastation during a key election year. We urge you to support this integral program by making a donation today. 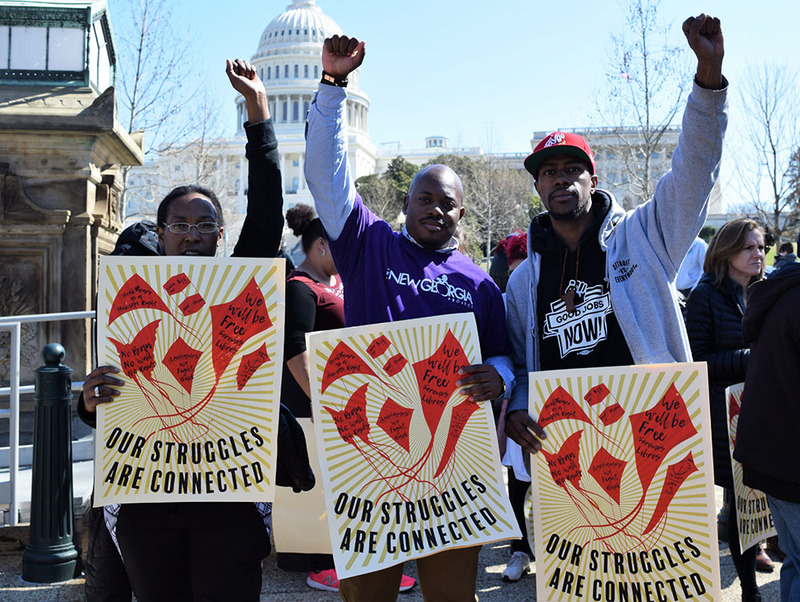 For the past two years, the Poor People’s Campaign has reached out to more than 30 states across the country gathering testimonials and thousands of poor people in order to chronicle their demands for a better society. As a result, the campaign released The Souls of Poor Folk which traces the 50 years since 1968, when Rev. Dr. Martin Luther King Jr., and thousands of Americans, launched the Poor People’s campaign. The study makes the case that the most pressing problems of our time cannot be tackled separately. It connects the attacks on voting rights to the attacks on basic needs like water, health care, living wages, and shift towards incarceration and criminalization of the poor, with disparate effects across race, gender, gender identity, and sexual orientation. Moreover, The Souls of Poor Folks reminds us of the importance of the ongoing and emerging resistance and organizing that is compelling a change in our national priorities. With this in mind, highly publicized, non-violent direct actions will take place in the District of Columbia and in state capitals around the country; the first action took place on May 14. Some CPD affiliates are anchoring Poor People’s Campaign actions in their states, while others are mobilizing to participate in weekly actions in Washington, DC. Our sister organization, CPD Action, will be helping to coordinate in-state actions across the country this summer, and we will come together in Washington, DC to drive our network’s federal agenda. or more information about Summer of Heroes or to get involved, please contact​​​​​​​ Jennifer Flynn Walker.